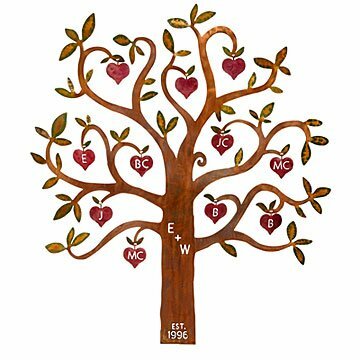 Celebrate your unique family tree with this customized design featuring your names and a special date. As each family member branches out into the world, you'll always have home to keep you rooted together. Chris Crooks' wall art celebrates your unique family tree with sweet customizations. He carves the trunk with each parent's initial and a special date, whether it's their wedding day or the day they met. Then, he crafts dangling heart "leaves" with the initials of up to 11 family members. Finished with bright pops of acrylic paint, the steel piece makes a loving statement in your living or dining room, and serves as a reminder to gather together more often. Handmade in Arizona. Perfect gift for family. Will look wonderful and last a lifetime and more! Absolutely Gorgeous - My Grandparents Loved It! I bought this personalized tree sculpture for my grandma and her husband of 9 years. I put the initials of all of their combined 10 grandchildren on the tree. They absolutely love it! They couldn't decide where to put it at first but settled on a wall in the den so that they would see it every day when they sat down to watch TV. Although this was one of the more expensive gifts I bought for the holidays this year it was completely worth it to see how much they adored their new family tree sculpture. I used the initials of my ancestors on the leaves. Everyone who sees it on my wall comments about it because it's so unique. I like that the branches stick out from the wall, but one could make it flat on the wall. The quality is exceptional and absolutely worth the somewhat higher cost. I am very pleased. This would make a wonderful anniversary gift.